According to Audrey Mae’s artistic cemetery map diagram and Audrey Mae’s gravestone numbering system, Ella W. Spencer’s gravestone is Gravestone Number Thirty-Four. Using her Smith-Corona typewriter in the 1980s, Audrey Mae typed the following mini-biography of Ella W. Spencer, a eighth-generation Spencer in East Greenwich, Rhode Island. 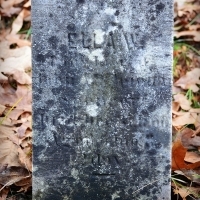 Ella W. born in 1860 is the child of John Anthony (gravestone No. 32) and Jamima Maxim (gravestone No. 31) Spencer. John Anthony is the son of Captain John (gravestone No. 4) and Phebe (née Vaughn) Spencer. Captain John is the first son of Huldah (gravestone No. 1) and Patriot John (No. 2) Spencer. 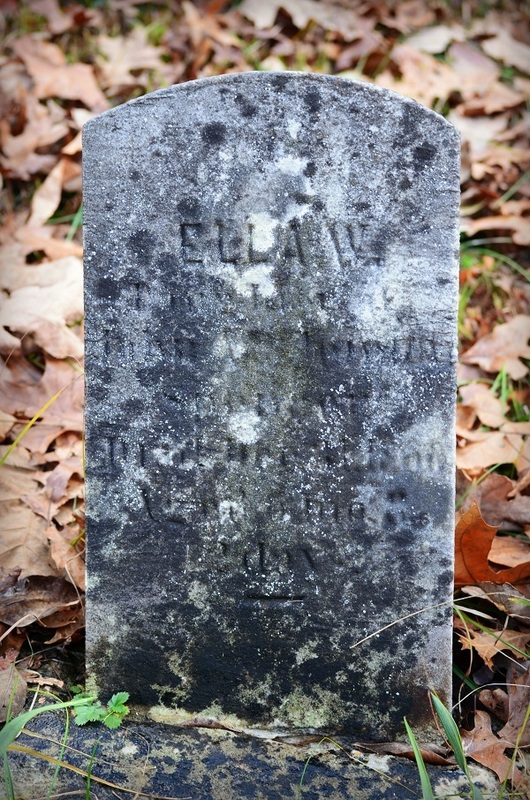 Ella W. only lived a few months. John Anthony and Jamina Maxim three daughters, Martha, Ella and Alice are buried in the Spencer Family Cemetery. Ella died at six months. Audrey Mae did not record the causes of their deaths but noted that their Spencer great grandparents died at age 70 and age 89, their grandparents died at age 54 and 74 and their parents died at age 85 and 78. Apparently at that time in history, if a child did not die in infancy or childhood, they had a good chance of living to old age. This goes against the thought that our early colonials all died around age 40. The average age may have been 40, but that is just because the infancy and childhood deaths averaged with those adults who lived to old age skewed the statistics. Ella’s siblings in the Spencer Family Cemetery include a brother who most likely died in the Civil War and one brother who actually lived to age fifty-three. One can only hope that John Anthony and Jamima had other children who grew up, married and lived to old age and were either buried in their spouse’s historical cemetery, another Spencer Family Cemetery or their mother’s historical family cemetery. More research is needed. This entry was posted in All Gravestones, Born into the Spencer line, on January 9, 2013 by Heather.